The plot of Amadeus is enclosed in an outer narrative frame, in which Salieri is the mediator between past and present, reflection and action. The story of Mozart's life in Vienna and his early death is told in retrospective by the aged, but still suffering Salieri. 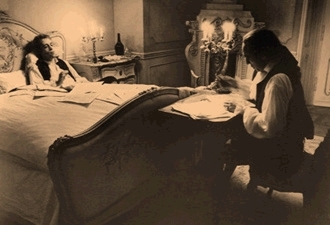 There are, however, differences in the method that Salieri's narration is used in the play and in the film. First, the stage Salieri recounts his story directly to the audience; in the film, a realistic device is used and Salieri confesses his crime to a hospital priest. In the play, he is "moving us toward the climatic action of cutting his throat; in the film, this act comes early on and serves as the hook" (Deemer) that arouses the curiosity of the audience. Now, the viewer wants to know why Salieri cut his throat and what events led him to do this. Both the play and the film consist of a blend of enacted episodes from the past and direct comments from the old Salieri. In this way, the spectator switches quickly between the periods and is always reminded that the events shown on the screen take place in Salieri's memory. This creates a greater distance between the viewer and the recounted events and leaves Shaffer a free hand for interpreting history. The dramatic device of the confession also allows Salieri to address the audience directly and to get the spectator involved into the story. Thus, the introduction of the priest in the film reduces the audience's responsibility, as it is not asked to judge any more, merely to listen to a tragic account. Still, the fact that Salieri is less threatening to the audience in the film does not damage his credibility or make his psychological portrait less profound. The story of his downfall is still stirring and distressing. Deletions and additions aside, the scene sequence in the play and in the film is more or less the same, but their balance is sometimes changed. "Salieri's revenge is the turning point in both the play and film, spinning the story into its more tense second half." (Deemer) However, this point comes a little earlier in the film, or rather the part following it is much longer than the second act of the play, creating a more balanced narration. The events that lead to Salieri's decision to destroy Mozart are now condensed, and the period in which his madness develops is expanded. This creates a fuller picture of Salieri's torment and leaves more room for his viciousness to be portrayed. We are confronted with "a film villain far more evil and dark than the Salieri we see on stage" (Deemer), but with a villain who can still win our sympathy. Finally, the very last scene of the play and the film, in which Salieri absolves all mediocrities of the world, has changed its emphasis. On stage, Salieri's words "Mediocrities everywhere -- now and to come -- I absolve you all. Amen!" (Play, 104) are directed to the audience, and so we ourselves, who were gods before, become the "mediocrities" to which he refers. In the film, he says the same words to the patients in the mental hospital as he is wheeled along the corridor. "The difference in tone is striking: even though the climax of the movie is much more powerful than the end of the play, nonetheless there is something personally threatening in Salieri's direct confrontation of the audience at the play's end, telling us of our human mediocrity." (Deemer) The message in the film is more moderate and is not insulting to the spectator, but at the same time loses some of its accusatory power.